A piano is not only an expensive musical instrument, it is a very sensitive one as well. If you love that piano dearly then you obviously be more careful while trying to move it from one place to another. Aside from the piano, there’s the floor that is at stake too. Depending on the floor type, one should be careful when moving the piano so as not to destroy the floor. Moving a piano across your hardwood floors is not an easy task. This is because your piano is heavy in weight and also due to the awkwardness design of the piano. A piano is designed with casters on its legs and whenever you try to roll the piano across the hardwood floor on the casters alone, you will most probably scratch your hardwood floor or might even break the legs of your piano. It is recommended that you find a few friends for the extra help and move the piano the smart way so that you would not damage your hardwood floor or the piano. If you have the budget, you may also hire the services of moving the piano from professional movers. The weight distribution of a piano is different depending on the type of piano such as the upright type piano or the grand type piano. You need to determine its weight distribution before deciding to move the piano. For example, the weight of an upright piano is centered between its two front legs unlike the grand piano where its weight is oddly distributed between the front and its elongated rear. First step that you need to do is to lift the piano and move it away from any walls and set it back down to enable you and your assistants of having better access of the piano. Before you start to move the piano you need to make sure that you secure its lid (ensure that the lid is lowered and locked), fall board and legs. As for a piano that has wheels, ensure that it can roll accordingly and easily. Remember not to drag the piano across your hardwood floor because it will damage your carpet or the hardwood floor or even causes the piano’s legs or its pedals to break off. You need to place plywood or cardboard on your soft hardwood flooring in order to prevent the flooring from being damaged by your dolly wheels. Then, you must place a piano dolly near the piano so that you do not have to travel far to place the piano on the dolly. Once you have moved the piano a few inches, you should stop for a while to have a rest in between. If you do not have dollies, you can simply obtain it from rental companies and at least three dollies should be placed under the major support areas of your piano. With an even weight distribution, you have to place the piano on the dolly gently and carefully. In order to lift an upright piano, you must lift one side of it (does not matter whether it is left or right) and slowly slide the dolly under the piano to enable the dolly’s edge to extend out beneath the keys. Once the dolly is centered in between the two of the piano’s front legs, you need to sit the piano down. As for a grand piano, you must tip its flat side onto the piano’s dolly and ensure that its front and also the rear are evenly distributed. Once done, you must make sure and double check the piano’s weight distributions before you start to move the piano. 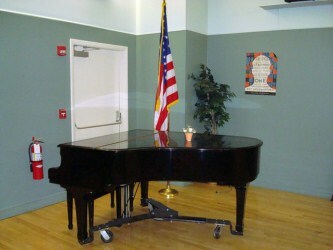 To prevent the piano from falling, you must ensure that the piano does not teeter one way or another. Make sure that you have cleared any items that could be in your way along the way to the new location that you want to move the piano. After you reached to the new location, you have to roll the piano across the hardwood floor and sit it on the new location. This task can be done by one person and you need to coordinate this carefully in order to unload and position it. Once it is in place, you need to test and tune the piano whether to do it immediately or in a week or two. This should be done just to make sure that the tune of the piano is maintained because there is a possibility of a climate change for different rooms that may result to different tunes. The Art of Wood Finishing. A Condensed Manual for Furniture, Piano and Hardwood Finishers, Painters, Interior Decorators, Etc. This entry was posted in Floors, Home Improvement on December 26, 2010 by Mike.